Literary writers have a long history of being technophobic, with many believing that internet-era inventions such as e-books and social media are leading society to its slow and inevitable demise. That said, while there are undoubtedly still writers out there who continue to stick stubbornly to tradition and make use of notebooks and typewriters, the vast majority have adopted computers as a necessary evil, producing their work as digital files instead of with pen and paper. Quick notes, ideas, research, character profiles, rough drafts, short stories, book chapters, manuscripts, entire novels—that’s a lot of precious, often irreplaceable data, representing hours if not years of laborious creative work. Can you imagine it disappearing with a snap of the fingers (or, as is more likely, with the drop of a filled coffee mug onto your keyboard during yet another late night writing session)? So even if you are a writer of the ludditian persuasion, hear me out. Do yourself a serious favor and properly back up your files. It could save your sanity—not to mention your ability to meet your publisher’s deadline. Read on to find out more about our 5 best backup services for writers! Dropbox is a hailed as the simplest way to store and share files, making the easy-to-use software the perfect online storage option for novice computer users (as creative writers are wont to be). With an archiving option for finished works, selective syncing, the ability to access data from an unlimited number of connected devices, and the free account offering its full range of features and 2 GB of storage, you really can’t go wrong with Dropbox. It’s even compatible with Scrivener, the crazy popular writing software from Literature and Latte! If your work is in the proofreading stage and you need to constantly swap it back and forth between yourself and various editors, or if you’re in the midst of writing and would like some feedback before beginning your next chapter, then what you need is Google Drive. Google Drive is easy to use and requires no download—only a Gmail account. It’s compatible with Microsoft Word (the word processor of choice for many a writing aficionado) and offers a whopping 15 GB worth of free storage space. Better yet, files created within Google Drive don’t even count towards your quota. That said, Google Drive, like Dropbox, is seriously lacking in basic security measures. But if ease of collaboration and the peace of mind that your work is stored in at least one other place beside your laptop is all that you’re after, then Google Drive really can’t be beat. While most writers have the opposite problem—finding it hard to find people to even look at their novels—if you’re a bestseller with a highly anticipated sequel in the works, or are plain paranoid about a hacker stealing your manuscript and trying to sell it as their own, then SpiderOak is your best backup option. A leader in cloud security, SpiderOak offers end-to-end encryption and a zero-knowledge policy, ensuring that you and only you can access your data. 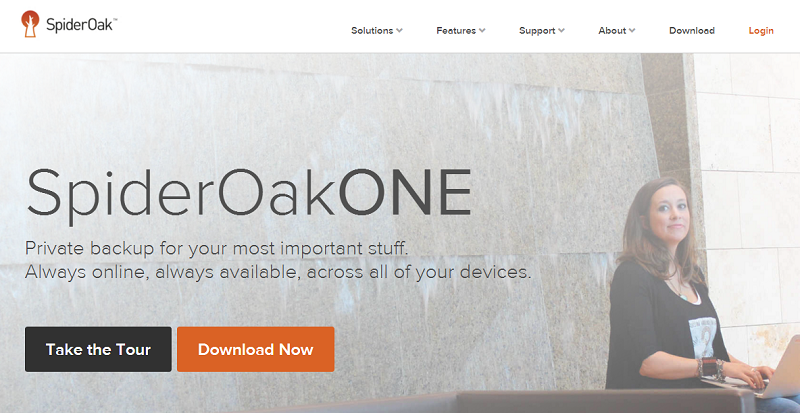 SpiderOak’s main caveat is its file-sharing feature, which can be painfully slow and complicated. Requiring both parties to navigate through layer upon layer of security to exchange data, it’s great for sharing highly confidential details with your publisher but terrible for casual collaborative works. However, what SpiderOak lacks in convenient file-sharing, it makes up for with other useful features such as automatic backups and unlimited versioning. It even offers 1 TB worth of secure storage for as little as $12 per month. SugarSync offers a good balance for those who want the sync and share options of online storage providers like Dropbox and Google Drive but with a slightly higher level of security. The cloud provider’s strongest feature is undoubtedly its file and folder sharing. You can control permissions—thereby determining which of your files are read-only and which are available for others to edit—and links can be sent privately via email or publically via social media. Some writers may not be so happy with SugarSync’s limited file versioning (they retain only the five most recent copies of your files, well below the average), but it more than makes up for it with its other features—namely its email uploads. Users can either set up a SugarSync email address or sync the service to their Gmail account and from there on any email attachments sent or forwarded to this address will be automatically uploaded to the cloud. Writers are notorious for emailing themselves copies of their current writing projects at the end of each creative session, so this handy feature allows them to continue their habit, but with an extra layer of security. IDrive is a good deal for writers who are looking for secure backup and file sharing but also minding their budget. The provider’s basic plan offers 5 GB of free storage (plenty of space if you’re looking to backup primarily text documents) and is a subscription, not a trial, which means that it’ll stay free. Not enough space for you? IDrive’s paid plans are also wallet-friendly, with 1 TB clocking in at $44.62 in your first year. A word of warning, though: IDrive only offers annual plans and has a strict no refunds policy, so be sure to test the free subscription thoroughly to make sure the cloud provider is a good fit for you before buying additional storage space. That said, we think writers will be more than happy with IDrive. A great combination of both online backup and online storage, it offers the best of both worlds, with automatic uploads, file sharing and synchronization, plenty of storage space, and the ability to access your files on the regular. While we put together all of our Top Backups lists with the aim of introducing our readers to the best online storage and backup solutions on the market, this roundup was made taking a slightly different approach to our standard 1-5 ranking. Due to the varying needs of writers, we decided to select a few key features that we believe are likely to tick the most important boxes and drew attention to the services that do them best. That said, we take care to ensure that every cloud provider we recommend is an all-around good service, so we believe you won’t go wrong regardless which one you choose! Whether you’re a published author, a hobby writer, or trying your hand at NaNoWriMo this year, you’re producing numerous files of immeasurable value that represent hours, if not years, of creative work. Don’t risk losing a potential bestseller—spend a few minutes (and maybe a few dollars) signing up for and setting up a cloud service to ensure your documents stay safe. Heck, consider putting together a 3-2-1 backup plan!